Authorities on Long Island are looking to catch a couple they say were living the high life with a stolen credit card number. Suffolk County police released dive video of the man and woman Friday. The video shows them plunging from an airplane over Shirley with instructors. 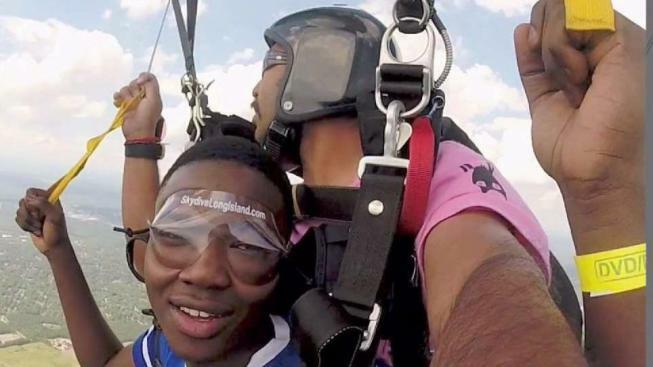 The duo allegedly used a stolen credit card number to pay for two dives and a photo-video package at Skydive Long Island in Shirley back in June. The bill totaled about $700. When the charge was denied by the credit card company, the owner of Skydive called the card's owner — a man from Washington State who said his wallet had been stolen. Police on Long Island say skydiving video shows a man and woman wanted for identity theft. The dive video shows them soaring over Suffolk County with instructors, police say. Suffolk Police Chief Stuart Cameron called the duo's skydiving spree "brazen." "Normally if you're using a stolen card, you don't want to have your photos taken," Cameron said. Police say they’re offering a $5,000 reward for information leading to an arrest. They’re asking anyone with information to call Suffolk County Crime Stoppers at 1-800-220-TIPS.